It’s also an interesting doc to watch after either (or both) “The Tree of Life,” with its simplistic dealings with Heideggerian ideas (which someone like Fischer must have shared, even if he didn’t read the philosopher, and I’m not just referring to their mutual Antisemitism), and “X-Men First Class,” which relates to Fischer’s 1972 World Championship win against Boris Spassky in that they both involve exploitation of the Cold War for popular entertainment (in the X-Men universe, were there also evil mutants at play in Reykjavik that summer?). 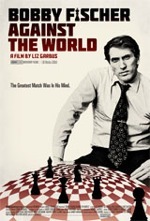 More than a decade before “Rocky IV” and years prior to the 1980 Olympic hockey game between the U.S. and USSR (depicted in “Miracle”), the East vs. West tension played out over a chess board. Check out the UK trailer, which I posted recently, here.